North Franklin School District is implementing a new anonymous reporting tool called “SafeSchools Alert Bullying/Incident Reporting System." 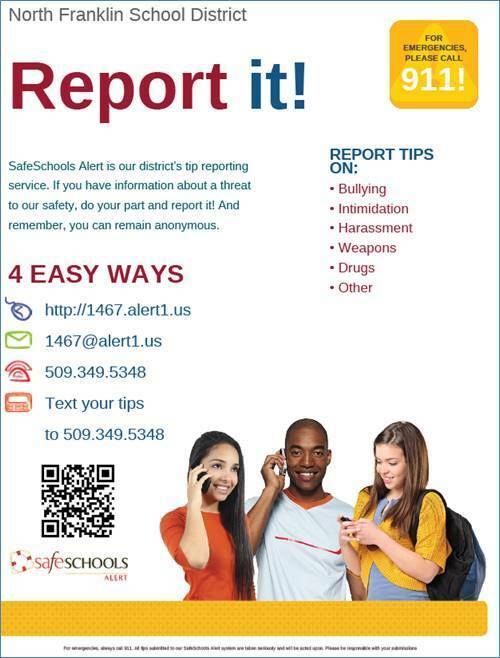 The Safe Schools Alert System is a system where students, staff, and parents can confidentially report safety concerns, including bullying, weapons, and threats of violence to administration at any time. Information about this new system is being sent home with all students. There is a link found on www.nfsd.org under the “menu” button. The reports do not come directly to teachers. They come to principals, and principals follow up on them as they would any other report. This system does not replace other forms of bullying and safety reporting. It serves as an additional method, and allows for anonymous reports to be made. It is our job to encourage students and families to report to the school district any situations of bullying, suspected weapons, threats or suspicions of violence or suicide, or other safety concerns. This serves as a convenient method to do this without fear of retaliation or the stigma of going to the principal’s office.